In Visual Studio, you add project references to indicate that you want to use types from another assembly. For example, a main application (e.g. 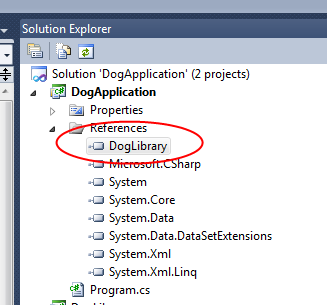 DogApplication.exe) might reference a class library (e.g. DogLibrary.dll) containing types that it wants to use. These references allow the compiler to make sure that you are using the dependent types correctly, based on the metadata contained in the referenced assembly. When you build a project, information represented by project references is converted to assembly dependency information, stored in the manifest of the assembly that you are generating. An assembly’s manifest contains information about all of the other assemblies that the assembly depends on. You use the IL Disassembler to look at an assembly’s manifest. 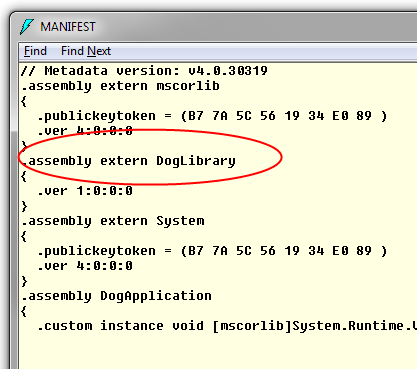 Double-click to open the manifest and you’ll see that DogLibrary is listed as a dependent assembly–an assembly that the DogApplication assembly depends on in order to run.